(I have a pleasant memory in regard to the Martin bookstore. On my first visit to Campbeltown, with wife Mary, we were strolling the streets and came upon the book store. I felt we should pay it a visit. What a treasure! All kinds of books about the area. I found a couple of early copies of the Kintyre Magazine and purchased them. I had seen a copy previously at my father's home in Illinois so they were not entirely unfamiliar. After the purchase, the storekeeper asked if we would like to sign her list of foreign visitors, we did and as I glanced through it found a familiar name from my boyhood community near Argyle in Illinois. Phyllis Nelson Gordon had visited there and signed also, she was the daughter of Mrs. Elsie Reid Nelson. This purchase was the beginning of a collection that contains all copies of the Kintyre Magazine. Kinloch Park had replaced the malodorous Mussel Ebb, though the odour problem wasn't quite solved. There were three hotels, a score of distilleries, half a dozen churches and a cottage hospital. Several fine villas and red sandstone tenements already graced the townscape, with more to come. A splendid Arts and Crafts building housed a new library and museum. William McTaggart was painting every summer in Machrihanish and Carradale. It was a propitious time for Captain Duncan Martin to rent a shop at 14 Main Street, on the comer of Bolgam Street, right on the tourist route from the pier. Captain Martin, master mariner, is the hero of a famous Campbeltown sea rescue. On a stormy night in December 1908 the ketch Jane from Belfast was foundering in the Loch and the lifeboat, damaged in another operation, was unable to help. Captain Martin commandeered a skiff, organised a scratch crew, and made two attempts to save the men lashed to the rigging of the stricken ship. On the second run two brothers were rescued, though their father had died of exposure. For this exploit Captain Martin received the silver medal of the Royal National Lifeboat Institution, very seldom awarded except to RNLI personnel. But this was still in the future when he took on the Main Street shop. Over his career he was by turns a fisherman, a ship-owner, and the skipper of the luxury steam-yacht Medea. He was married twice, to Euphemia Sillars and Annie Mathieson, and was the father of six daughters, Aggie, Katie, Effie, Janet, Mary and Barbara, and five sons, one of them lost at sea. A large family to provide for and to see settled in life: it was a responsible and far-thinking paterfamilias who acquired the shop in Main Street to get two of the girls, at least, started on the right path. Martin's opened for business on 4 May 1901, announcing itself in the local papers as 'Stationers and Tobacconists', with 'daily and weekly newspapers, etc, supplied'. Family lore has it that the original business was a grocery, not necessarily on the same site. Certainly in the 1881 census Captain Duncan's sister-in-law Agnes Sillars, aged 21, who lived with the Martins in North Shore Street, is described as a grocer. The previous tenant of the shop was Agnes Watson, possibly a grocer and possibly a relation of the Captain's: there are Watsons in the family tree. There are still some threads to be pulled together in this early time. The Main Street shop appears in a 1903 directory as being kept by A. & K. Martin. They were the Captain's two eldest daughters, Agnes and Katherine, both in their early twenties at this time. Agnes, however, had other fish to fry. She became Campbeltown's first trained midwife, serving from 1912 to 1924, a heroine in her own right as she travelled to remote cottages and flood-isolated houses; once she had to beat the tide to reach Davaar lighthouse before the baby did. Then, apparently, the fourth daughter, Janet, joined the enterprise, for the listing becomes 'K. & J. Martin'. Janet worked in the shop, but she was being courted by a sailor, and married him in 1912, when she was 26. At some point the business became just 'K. Martin', and certainly from then on Katherine was in sole charge. That block of Main Street is a Georgian tenement built about 1820 by one John McLean, after whom it was called McLean's Place. Historic Scotland describes it as 'a remarkable survivor' and comments on 'the uniformity of the windows and dormers, which survive intact'.i A modern estate agent's report puts the total floor area of the shop at a prosaic sixty metres square, but customers remember it affectionately as, somehow, smaller than that: 'the little cluttered shop ... a haven for booklovers'.ii Agnes Stewart remembers it as 'a veritable Aladdin's Cave ... a magic place'. And there's an upstairs floor! This was a total surprise to the present writer when it emerged in the course of research, and, as we shall see, it was a treasure cave too. To begin with, the wares on sale were varied to say the least, as early stock books and advertisements make clear. School requisites; stationery; greetings cards; newspapers (until World War II, when that trade was taken over by Keith's farther up Main Street); knitting patterns; playing cards; stamps, albums and accessories; sheet music and instrument parts (continuing into the twenty-first century); violin pegs and strings; maps and charts, most important in a seafaring town. And, since Campbeltown was also a tourist destination, there were children's buckets and spades, and crested china (Arcadia and Goss), a popular souvenir. In the 1930s, charmingly, there's pebble jewellery, the pebbles hand-selected from Machrihanish beach. There were also postcards, another must for tourists. Latterly these were from the big publishers like Valentine, but at first Martin's published their own. 'I think all the newsagents had their own postcards,' writes Maureen Bell (her grandfather Edward Keith was early in the field) iii 'and perhaps employed photographers ... I've noticed that all the village shops published postcards too.' No definitive list of Martin's postcards has yet been compiled, but they cover most of south Kintyre: the Cauldrons (sic), the Mull, Ki1colrnkeil, Dunaverty, the old houses at the Pans. Most appear to be rural scenes (thus, annoyingly, not readily dateable by cars or costumes), but there are some of the Wee Train, and Martin's seem to have a bit of a monopoly on churches: Castlehill, Lorne Street, Lochend. One postcard deserves special mention, since it prints the full text of the Campbeltown ballad 'Flory Loynachan'. A copy has been found dating from the first years of the twentieth century. 'A highly cultural gesture,' suggests Angus Martin, and evidence of Katherine Martin's early interest in local history, which was to flourish later on. And let's not forget the plug tobacco, much in demand. Two of Angus Martin's aunts, Carrie and Bella, were employed in the shop during its first half-century, and 'one of them would slip a wee bit extra tobacco to old fishermen she had a soft spot for, when the boss wasn't in the shop or wasn't looking. These would be wee bits that had been cut off to get the weight exact, not lumps purposely removed,' Angus scrupulously adds, exonerating his aunt from criminal charges while giving us a lovely picture from the earlier days of the shop. But there were always books, and high-quality books, from near the beginning. There's a Collins Shakespeare in the 1907 stock book, and it wasn't necessarily a 'school requisite'; the first printed catalogue of the Campbeltown Library, dated 1899, reveals just how wide and deep were the town's reading tastes. When the shop was cleared in the twenty-first century, works in fine bindings with Walter Crane illustrations were found, dating from before 1914. There was a shedful of works on seamanship, coming up to at least World War II, perhaps finally overtaken by technology but essential in their time. Somebody was selecting the stock with knowledge and care. And with pride: at some point we find the famous little rectangular sticker, one inch wide by a quarter-inch deep, gold on black till 1951 and then white on blue, inside the cover of every hardback book. Somebody was also a stickler for commas. By the 1950s advertisements for the shop are unambiguous. The Newest Books Kept in Stock. We are Always Pleased to Obtain Any for your Special Requirements. What these small ads never reveal is the person behind the discriminating choice: Katherine Martin, by now an imposing presence known to the whole town as Mrs Johnston. Her family called her Katie, and, in her youngest sister's description, preserved by the next generation, she had black hair and blue eyes. 'But she got angry if anyone said she looked Irish.' That's a clue to the rest of the description: 'Strong-willed. Most of the Martin women were.' She married John Johnston in 1910 and they had three children, Efric (later Wotherspoon) b. 1913, Margaret (later Webb) b. 1921, and Alistair, b. 1923, who (Captain Duncan's grandson after all) was in the Merchant Navy. There's a gap in the family because John was in the Argylls during World War I. He was gassed; later he was a clerk in the local Unemployment Office. The family lived in Main Street and then Dell Road, also in Royal Avenue Mansions at one time, moving to the attractive lochside house Sandbank in about 1928. This final move settled the family firmly in Dalintober, once a separate fishing community though now part of Campbeltown, to which the Martins historically belonged. John's granddaughter remembers him as 'a soft-natured man'. Perhaps that, and his possibly uncertain health postwar, account for Katie, married with a family, continuing to run the bookshop, still trading under her own name too. But just as likely she wouldn't have dreamed of giving it up. 'Formidable' is her granddaughter's description. The Johnstons belonged to Castlehill Church but Katie stayed in Loene Street and took the family there; no small declaration of independence for the time and place. She was clearly a most intelligent woman and her interests were wide, not to say unusual for the time. She belonged to a writers' group. She was vegetarian long before it was fashionable, and keen on fresh air, sun, sea water, and the writings of Marie Stopes. The younger children, when ill, were given herbal remedies, sometimes to the annoyance of Efric who was by then a qualified children's nurse. Katie was interested and knowledgeable in local history, publishing at least two pamphlets, Southend Through the Ages and Saddell Castle. There is no sign that she belonged to the Antiquarian Society, surely her natural home, but Angus Martin points out that the Society, like many such, was virtually male-dominated until well after World War II. We may perhaps imagine Katie's views on that. She continued to run the bookshop right through the war years. During the air raid on Carnpbeltown in November 1940, which partially destroyed the Royal Hotel only a few yards from the shop, people were advised to shelter under a lorry. No sheltering for Katie, who decided to walk home. The lorry was machine-gunned. During the war Campbeltown shops closed at five to save electricity, and most kept these hours in peacetime. Martin's was one of the few which opened till six; regular customers would come in after work, often staying to chat to Katie. Other regular visitors were the local tinkers (as they were always called then, the preferred term nowadays being travelling people). For complex reasons, there was much illiteracy in that community at the time, and the tinkers would take letters to Katie to be read; if any needed answering, she would write the replies. The present writer remembers her about that period, by then white-haired, hawk-faced and always in black, a venerable figure, yet ready to discuss books with a small girl. These finds were upstairs, in what had once been a selling area and still had a counter (and the mantelpiece of a hearth). Katie's daughter Efric, now widowed, brought her children to Campbeltown for the school holidays, and her daughter, another Efric, has clear memories of that time. Katie died in April 1957. Though she was such a kenspeckle figure in the town, the Courier carried no obituary. In the same month two other well-known and respected local shopkeepers died, and both got a write-up, but they were men. Once again, perhaps we may imagine that Katie might have had something to say. Katie's daughter Efric - her name a Gaelic cognate of the family name Euphemia - was a nurse in Glasgow and Liverpool before marrying lain Wotherspoon from Gigha (whose family, incidentally, had owned the second ship which grounded during the stormy night of Captain Duncan's exploit). They had three children, Margaret b. 1938, lain b. 1940, and Efric b. 1943. When World War II broke out, lain was in a reserved occupation as an aeronautical engineer, but he volunteered for active service in the RAF. His daughter summarises the story. As we have seen, the family spent holidays in Campbeltown, when Efric helped in the shop. She had gained bookshop experience in Allan's and Jackson's in Glasgow, and moved permanently to Campbeltown in 1951, becoming a partner and taking over on Katie's death. Her daughter calls her the bookseller par excellence, and her many customers would agree. At home she was always surrounded by books and newspapers; she read all the reviews and stocked what would be wanted. She was on the council of the Booksellers' Association, but her real glory was seen in the shop. She was usually to be found in discussion with readers, not just local ones: holidaymakers would come in year after year and bring her up to date with family events. Agnes Stewart, who was friends with Efric's daughter Margaret, remembers the shop, and that wonderful upstairs room, with particular warmth. Rather more significantly, she was, as Angus Martin says, 'a veritable fund of local history and genealogy'. She was secretary for many years, and then president, of the Antiquarian Society, and was appointed F.S.A. Scot. She travelled widely, always alert to find a Kintyre connection, adding to her information and her collection of slides for the popular talks she gave all over Kintyre. Such was her local knowledge, says her daughter, 'that the shop became effectively an information exchange for visitors, many from overseas, seeking their roots'. She was still to be found behind the counter well into her eighties, and when she died in 2000 was probably Scotland's oldest practising bookseller. After Efric's death, her son lain and her daughter, another Efric, took over the family business; lain had been in the book trade, with Collins Publishers, for many years. Sadly he died in 2007. His sister continued to run the shop, but necessarily in tandem with her chartered accountant's practice. Meanwhile times had become very difficult for independent booksellers. Publishing had been transformed by mergers, and books could now be bought from big bookshop chains and supermarkets at discounts which the independents couldn't match. Perhaps the last straw was the rise of Internet shopping; you could buy your book, again at a discount, without getting up from your chair, let alone walking down Main Street to the little shop on the comer. Martin's closed with regret in July 2012, a hundred and eleven years after Captain Duncan's daughters had opened the shop in the very different Campbeltown of 1901. Warmest thanks are due to Efrie McNeil, without whose ready help and interest this article could not have been written; Angus Martin, who supplied much information, some anecdotes, and pages from his unpublished Martin family history; Mary Davidson, who first suggested it; and John Arbuckle, Maureen Bell, Barbara Harvey, Carol McNeill, Agnes Stewart and Alistair Webb for memories, family lore and glimpses into the world of the postcard collector. Background has been checked in The CampbeItown Book (Kintyre Civic Society, 2003), and mail coach memories are from the late Flora McNeill. i. Quoted in Michael Davis, 'Architectural Campbeltown', The Campbeltown Book (Kintyre Civic Society, 2003), pp. 368-384 (p 378). ii. Margaret Macaulay, 'Bookseller and antiquarian: Efric Wotherspoon', Scottish Book Collector 6:11, Winter 2000-01, p. 37.
iii. Maureen Bell, 'Edward Keith, Postcard Publisher', Kintyre Magazine 62, Autumn 2007, pp. 22-23.
iv. Obituary, [Glasgow] Herald, 21 November 2000.
v. Margaret Macaulay; see note 2. Readers who are familiar with the varied accomplishments of Dr Norman Morrison (1869-1949) may be surprised to learn that to distinguished self-taught naturalist and author may now be added 'photographer'. This additional distinction was revealed to me in July by Dr Finlay Macleod, writer and broadcaster, from Morrison's native village of Barvas on Lewis, who telephoned to enquire if Morrison had left any photographic legacy of his time in Kintyre. I could tell him only that if there was such a legacy, I was entirely unaware of it (though I knew that he had used his own photographs to illustrate his books). My interest in Morrison goes back many years, and in 2009 I published an account of his life in issue No. 68 (pp. 22-23), which was later reproduced in By Hill and Shore in South Kintyre (pp. 269-70). That account stemmed from a discussion of Adders, which was Morrison's specialist subject and for which he was awarded a French Doctorate of Science and admitted as a Fellow of the Zoological Society of Scotland. His record of service, which is in Argyll & Bute Council archive in Lochgilphead, reveals that he was stationed in Campbeltown from 2/3/1892 to 18/8/1897, and that he returned on 31/10/1919. That was to be his final posting, because by then he was in dispute with the police authorities over his trade union activities, and on 15/3/1919 had 'compulsorily resigned for refusing to resign membership of the National Union of Police and Prison Officers', of which he was a founding member. That resignation, however, was 'temporarily suspended', and on 1/2/1922 he retired on a pension, having completed 30 years' service in the police force. He remained at Beith Place, High Street - where Dalintober Post Office was - until his death on 3/4/1949. He was buried at Killean, where the family gravestone may be seen. In mid-July of this year, Morrison's life was celebrated on his native island with two days of practical sessions on wet plate photography, followed by a day's seminar with a variety of speakers and a full exhibition of his photography. A Gaelic radio programme on Morrison was broadcast the following week, on 24 July, and a documentary is being filmed for BBC Alba, for which watch out. Watch out also for an exhibition of his photographs which is likely to take place in Edinburgh. The title of a book sometimes gives an idea about the nature of its contents. In this case, the indication is that its subject might be of interest only to football-following residents of a small, far-flung, isolated part of Scotland. This is by no means the case. For an opening, the reader is presented with an excellent history of the origins of the game of football: at least from the times of the Roman Empire, then through the wild-and-woolly recreations of the Middle Ages up to the organised competitions and rigid rules of the present day. Then, having given us an easily-taken-in history of the Beautiful Game, the author brings Campbeltown - and its surrounding district - into focus. Linked to and interwoven with the football is Campbeltown's own history - at least over the past two centuries - the fluctuating prosperities engendered by the herring fishing, the shipbuilding, the whisky, the coalmining, and the arrival of military establishments. It is worthwhile to consider the number of distilleries in the town itself. So many, in fact, that the horde of excise officers required could start a football team of their own! And we discover that events 3,000 miles away dealt a severe blow to one of Campbeltown's main industries, the production of quality whisky. This was the imposition of Prohibition in the U.S.A. This is only one example of what can be learned from Alex McKinven's book - and there are quite a few sidelines of this sort which must be left to readers themselves to follow up. For it is the football which ties everything together. The author's reporting of the many games he has chosen adds colourful circumstantial details to his narrative, as well as drawing our attention to interesting facts; for instance, what Scottish Junior Football Club had an Italian international playing for them? And what club beat a Glasgow Rangers F.C. select? A Campbeltown club in both cases. Then there's that remarkable time in the hungry 1930s - about which time McKinven has a great deal to say - when Campbeltown fielded no fewer than six Junior teams. It might be as well to settle what is meant by 'Junior'. The regulations can be easily consulted, but one overarching definition holds: it's not a matter of ages, but simply that players in the big national leagues are full-time professionals training daily, while those in the Junior leagues are, without exception, part-time players with weekday jobs, turning out each Saturday (when their occupations permit), and training on perhaps two evenings per week. At the end of the Second World War in 1945, there was a tremendous upsurge of interest and activity as a deprived nation sought to return to normal life. The author remarks on this, and how it showed in Campbeltown, with relevant conclusions to be drawn from the evidence he provides. From the late 1940s to the mid-1950s, that is until television arrived, Campbeltown fielded five officially-registered Junior football clubs. What size of a population supported this number? At that period, the town's population was around 5,000. Machrihanish and Drumlemble were lumped together at around 600, Carradale, Dippen and Saddell at 450, Southend at 450; round the total off at 7,500. All the other Junior clubs in Scotland are based in densely populated districts, usually dependent on coal-mining or concentrations of heavy industry: Glasgow, Ayrshire, Lanarkshire, Fife, the Lothian's, Dundee and Aberdeen. All districts whose populations greatly outnumber that of the southern end of Kintyre - and if that doesn't measure the part Junior football has played in Campbeltown, what does? Obviously, Kit and Caboodle, though the real answer lies in the realms of sociology, and, indeed, psychology, and this reviewer is certainly not going there. But surely emotion can be mentioned? Alex McKinven has skilfully taken us through the tensions, excitements and amusements of various matches, the agonies of successes and failures as various clubs make their way through the league and cup competitions, and with glimpses of certain players' personalities into the bargain. This is a very well-written, enjoyable, and informative book. It will delight Campbeltown readers; it will equally be enjoyed by anyone interested in Scottish Junior Football, which is the backbone of the game. A too-big claim? Where did our great Scots players come from? Just consider the state of Scottish football in this year of 2013. Of the 40 clubs participating in the full-time senior leagues, one has been rescued from drowning and is re-starting at the shallow end, two are on their uppers and facing annihilation, a number of the others are looking on and living on their nerves. Meanwhile, the near-200 Junior clubs keep plugging happily away, serving up entertainment, often of high quality, to their supporters - as well as much to argue about. Alex McKinven has, in Kit and Caboodle, given us a rather delightful look at Junior football - and not merely in Campbeltown at that. CAMPBELTOWN MUNICIPAL GOLF COURSE. Mr Anthony Pioppi, who visited Kintyre this summer, is researching the nine-hole municipal golf course on Hillside farm, a neglected chapter in the town's sporting history. The course opened in 1913, but when did it close? If anyone knows the answer, or has other information, please contact Mr Pioppi through the Editor. On a very warn Sunday in June 1978, as a new member of the Society I joined the others on a field trip to Ballochroy Glen. We were met there by Ian MacDonald who started the day by relating to us the story of the ship that anchored at the mouth of the glen in 1851 and of the 24 families who abandoned their way of life in the glen and sailed off to Canada. The glen was emptied. He guided us around the ruins of Ballochroy, showing us the old mill, smithy and houses, then led us to the ruins of Kilmichael Farm and then up to an old gravestone of the tobacconist from Inveraray who had drowned nearby in 1756. The day continued with visits to the site of the old school and further ruined farms, and all the time Ian was telling us about the families who once lived there, the McQuistans, McKinlays, McKellars, McQuilkans, Bells and many others, explaining how they fanned and how they had survived. He was in correspondence with their descendants now living in Australia, Canada and America. Ian was a walking history book. He made everything so interesting that day and I became hooked on what has become a continuing interest in fanning history and those who occupied the farms. Ian was born on 16 May 1919 at Beachmeanach Farm to Malcolm MacDonald and his wife Catherine McLachlan, who were tenants there. He was the eldest of six children and was brought up speaking Gaelic and English. He attended Cleit School and Campbeltown Grammar, leaving at 14 to help his father on the farm. In 1939, aged 20, he was called up to join the 56th (Army) Training Regiment Royal Annoured Corps but was released shortly after to return and plough farms in Kintyre under a government scheme. He then continued on to Catterick to receive training in tanks, including the new 'Churchill'. After attending an Army Selection Board, he graduated as 2nd Lieutenant from the Royal Military College, Sandhurst, in 1943. He was chosen by Col. Herbert Waddell to join the 7111 Battalion, The Buffs, renamed the 141st R.A.C. (The Buffs). In March 1944, this regiment was selected to be the first flame-throwing regiment. In July 1944, Ian was promoted to Captain and transferred to be Chief Instructor to the AFHQ in Caserta, Italy. He sailed there from Liverpool on the Cape Wrath, with tanks and flame-throwers, and was the only soldier on the ship. He saw his home, Beachmeanach Farm, as they sailed north to join a convoy off Oban. When the war ended, Ian was transferred to R.A.C.T.D. in Cairo and was demobbed in June 1946, having turned down the offer of promotion. He was mentioned in despatches for distinguished service. On leaving the army, he enrolled at the West of Scotland Agricultural College at Auchincruive to study agriculture and dairying. He returned home to work at Beachmeanach and in 1952 married Ina Park at Bellochantuy Church and took on the tenancy of the small farm of Portachoillan in Clachan. Simultaneously, he went to work with Lever Brothers and BOCM and was latterly employed by Kintyre Farmers Limited as a Technical Advisor and Representative. Ian loved being out on the West Loch setting creels for lobster, and he won many trophies for clay pigeon tournaments. Ian had a great interest in people and their family history, especially those from the parishes of Killean and Kilkenzie and KilcalmonelI. His maternal grandfather, John McLachlan, lived at East Killarow, where he was a herdsman for Macalister Hall of Tangy. In the early 1900s, many lairds owned a herd of Highland cattle as it was thought to be prestigious, and Ian recalled one of his grandfather's stories. When Macalister Hall, in front of his visitors, called in English for the cattle to move they ignored him and did not move forward until Ian's grandfather shouted Thig a seo! John McLachlan later took the tenancy of North Beachmore and also South and Mid CrubastiI. Ian's paternal grandparents were tenants at South Beachmore and then at Drumnamucklach, and he had family at Charlottan and Culfuar farms. Through listening to the family stories and working at shepherding and farming, Ian learned much about the history of the area, the families that lived there and the wildlife, and he did not hesitate to pass this knowledge on to others who showed an interest. Also, through his job of travelling around the Kintyre countryside, he met many farmers and would enjoy chatting with them. His knowledge of family history and of the old farms, now long gone, soon became apparent, and people nom all over the world would write to him with their queries and would travel to Kintyre to visit him. Others, on remarking that they were in Kintyre to visit their homeland, would soon be directed to Ian's door, where Ian and Ina always made them welcome. He was delighted to be able to unite four cousins, who had a common McCorkindale ancestor and had not known of one other. Ian had several visitors' books with a total of over 300 names in them. However, these did not include those he had helped but had not visited him in person, so the number he had helped was even more numerous. Ian wrote a number of articles for this magazine, including 'Largieside and its People', 'The Blues of North Kintyre', 'The Twa Brigs' and 'The Largieside Distillers', with some of these articles being republished in other magazines. He gave several lectures to the Society during the winter meetings, and, as I wrote at the beginning, he led several Society walks when we visited Largieside and North Kintyre. Ian became President of the Kintyre Antiquarian and Natural History Society in 1995, a post he held for three years, and in the year 2000 he became the Honorary President of the Society, which he always felt was a great honour. In 1986, he was elected a Fellow of the Society of Antiquaries of Scotland. He retired from Kintyre Farmers in 1982 and at the same time he stopped farming and moved into Shenakill in Clachan village. One of the highlights of his life, during his retirement, was when he was invited, along with Ina, in 1992, to North Carolina as the guest of Lt. Col. Victor Clark USAF, Retd. FSA Scot, Dr Don McNeill and others. Victor Clark was an Honorary Vice-President of the Society, who published the Argyll Colony Plus magazine and was immensely interested in the Kintyre Scots of North Carolina. Ian was asked to give a lecture and was very honoured to open the Flora MacDonald Highland Games in Red Springs during his visit. Other highlights were receiving a card from the Queen to mark their Diamond Wedding anniversary last year and Ian being awarded the Kintyre Citizen of the Year in 1999. 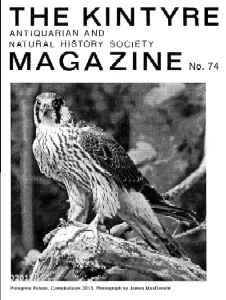 Ian was also a member of the Natural History and Antiquarian Society of Mid Argyll. He gave lectures to the Society and contributed articles and letters to its magazine The Kist, including one on the old names of the coastal areas of South Knapdale and another on the township of Auchindrain, showing the scope of his knowledge across Argyll. Ian was a man of faith and served as an elder in Kilcalmonell Church in Clachan, representing the congregation at Presbytery and Synod level. He served on Kintyre District Council and also on Argyll County Council before it was incorporated into Strathclyde Regional Council in 1975. Ian died at his home in Lochgilphead, where he had lived for the past ten years, on 3 February 2013, in his 94th year. Up to the end he had a great memory and continued to help others with their genealogy. He will be sadly missed. He is survived by his widow, Ina, their three children, Malcolm, John and Anne, seven grandchildren and two great-grandchildren. A NEW COAL FIELD. For some time past it has been the belief of engineers that coal is to be found on the Largie Estate, between Tayinloan and Clachan. We understand that measures will shortly be adopted to have the ground surveyed in order to discover the quality, extent, and practicability of working the supposed coalfield. Should present anticipations be verified, the opening of a pit in that neighbourhood would give a great stimulus to the traffic of the district, and would prove a convenient point for exporting coal to the Western Highlands and Islands. Argyllshire Herald, 20 Feb 1875. The place-names compilations for the parishes of Killean and Kilchenzie, Kilcalmonell, and Saddell and Skipness are now approaching completion and are scheduled for publication next year. The lists have now been checked by Ian A. Fraser (formerly of the School of Scottish Studies, and a leading expert in the study of place-names) who, incidentally, has been booked to give a talk to the Society (on Scottish personal names) in April of next year. The following place-names represent most of those which I have so far failed to locate. I appeal for assistance in locating these places (mostly settlements) before the booklets are sent to the printers. Ordnance Survey co-ordinates would be ideal, but, failing these, please get in touch with me, and the information can be assimilated through discussion. Ed. Achavrauladale (near Lagloskin); Arichoraig (near Corrylach); Ball Ranald (Skemish); Brodie (Dalkeith); Canada (Glencreggan); Cluash (Kilchenzie); Creggan (Glencreggan); Duff (Glenbarr); Gartlosk (Kilmory); Savanach (Killocraw); Sidrigill (general location unclear); Stelag (near Rhunahaorine); Tayvallie (Culfuar); Tigh nam Feadag (North Beachmore); Tigh na Sroine (Creagrua); Torchaonachan (near Loch Ulladale); Ulladale (near Loch Ulladale). Achadubh (near Clachan); Achadadunan; Auchreoch (Whitehouse); Ballachoran (near Stewartfield); Brantian North and South (Ballochroy Glen); Copenhagen (Clachan); Corrary (Ronachan); Cregnavullin (Clachan); Dalnacaman (Stewartfield); Dod Vui (near Whitehouse); Glackinlackin (near Corriechrevie); Glenakill; Knockanabuaichaill (Stewartfield); Knockanisera (near East Cammore); Knockanrioch (Ballochroy Glen); Lagnascavach (Whitehouse); Larachmore (Loup Estate); LeckiniLecknacurts (Balinakill Estate); Lochan Dughaill (near loch of the name); Loch Ciaran (two settlements near loch of the name); Lochend (near Loch Ciaran); Monebeg (Clachan); Muckroy (near Grassfield); Priestfield (Clachan); Tavnaloch (Loch Ciaran); Tobaraviate (Cambeg); Woodhouse (Achahoish). Arinabail (Skipness); Bealach an Tagairt (Saddell); Cnocanbiorach (near Cour); Craigcormick (Saddell); Feorlinmolach (Skipness); Gortan Cloiche (near Allt a' Bhealaich); Kimashie (Carradale); Poll na Bo Dearg (Skipness Estate); Sabhal mor (near Saddell Castle); Saint Mary's Loch (Grogport); Strahatildy (Skipness).